I apologize in advance for this super-late vacation recap post. Can't believe it's been almost 2 months. Anyway, second stop on our CA adventure was Venice Beach. The drive from SF to Venice Beach was right under 8 hours. It was easy and enjoyable for the most part. We stopped at Santa Monica for our first In-N-Out experience lol. It was pretty tasty I must say. I definitely prefer In-N-Out over Five Guys. What do you guys think? 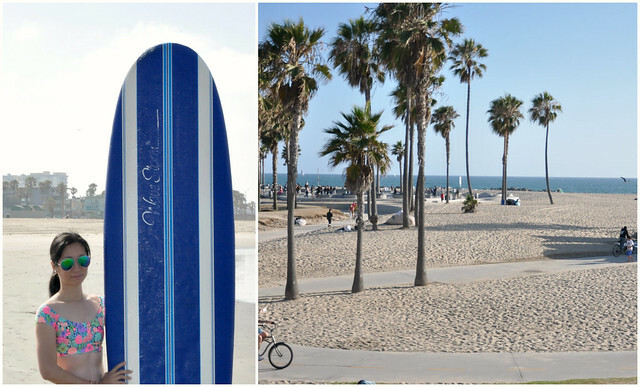 We booked the Venice Beach Suites and Hotel for our stay. The hotel located right on the boardwalk. Although, the room was nothing fancy, you can't beat the convenience. One thing I'd like to mention is that the staff was extremely friendly and helpful. They did everything they could to make us feel like home. I would highly recommend this place if you're in the area. There are several public parking lots nearby ($10 for the first 3 hours, $15 up until 9:00 pm and $25 overnight). We got up the next morning and spent basically the whole day at the beach. Full disclosure: I do not know how to surf, just borrowed the board from the husband for picture purposes only =) We checked out later in the day and headed to our next stop - Hollywood. Stay tuned! I wish I could do a hand stand like that! Room looked great! Looks like a great day. What a fun colorful top! That room looks awesome! What a fun trip!! That looks so fun! The beach is beautiful. Love that swimsuit, the top is so cute! I've only been to In N Out once, since we don't have them where I live, but it was so good. I love vacations photos! Love your crop top style swimsuit! I actually prefer Five Guys burgers (the beef at Five guys tastes better than In-N-Out for me), but In-N-Out has the best fries! Yum! For a "not so fancy" room, it looks very spacious with a lot of storage room! Much more floor area than what you would get with a branded hotel anyway! I think it's a good choice anyhow!